Washington state doesn't want a wall, and didn't vote for the president pushing a wall. But it looks like we're disproportionately on the hook to pay for it. It may have seemed that the wall fight was a distant battle, about a project on the southern border a thousand miles from Seattle and Washington state. But it turns out we rank in the top 10 for a dubious list: Being on the hook to pay for it. 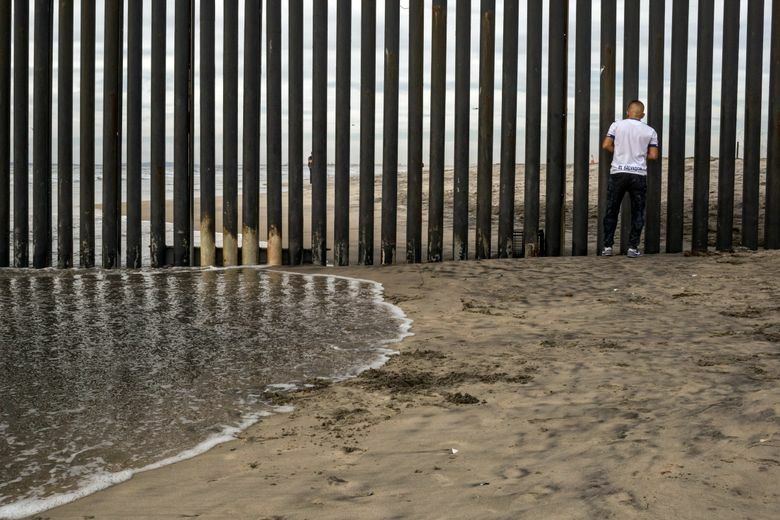 Congressional researchers now have had time to look into President Trump’s national emergency decree for a border wall — specifically where the money to pay for it would come from. News flash: Not from Mexico. Try, say, Kitsap County instead. The naval base at Bangor could lose $89 million earmarked for a new submarine pier that has been in the works for more than a decade. Or, say, Oak Harbor. Where Naval Air Station Whidbey Island may lose $27.4 million that Congress has already approved for two new facilities to support its Growler jets. Add up all the projects that are eligible to be tapped to fund the Trump wall, and our state is more on the hook to pay than Texas, Arizona or most places actually near the southern border, with the big exception of California. “I’ve been trying to raise the alarm, that outside of the political fight, there is the real potential for harm to our state,” Rep. Adam Smith, D-Bellevue, told me Friday. The reason Trump’s wall plan could affect states so differently is that it’s a seat-of-the-pants effort to reroute money already appropriated by Congress for other uses. The two biggest pots by far are $3.6 billion from the military construction budget and $2.5 billion for drug interdiction, also managed by the Defense Department. Any state with a heavy military presence likely would pay a steep price. A review by Governing magazine found the hit to our state could total up to $209 million, ninth most in the nation. California ranks first, with nearly $900 million at risk. Ten states had no military projects in the last budget and so aren’t on the hook to pay anything, including red states like Idaho, Iowa and Kansas. The Trump administration hasn’t tagged specific projects for cancellation yet, so the above totals represent what is eligible for shifting to a border-wall project. Consider poor Alaska. It has $288 million at risk, fifth in the nation. But it’s so far from the southern border that it’s a good 800 miles north of the northern border. But at least Alaska voted for Trump. In our state, the cuts could include $26 million for a refueling facility at Joint Base Lewis-McChord, and $23 million for an Army Reserve maintenance project in Yakima. Also on the block is $14 million for a hazily described “mission support facility” at a highly classified Joint Personnel Recovery Agency site outside Spokane. It’s involved in tracking and helping rescue U.S. soldiers when they’re taken hostage around the world. Smith is in the odd political position of defending military projects like this even as he represents a Seattle-area district that is so liberal it had no Republican candidate in the 2018 general election (the other candidate was a Democratic socialist). He said many voters here probably would be fine with slashing military-base projects. On Whidbey, for instance, the plan to expand the base is controversial because the Growler jets are so noisy. The only local poll on the question backs that up. A survey of 4,300 Washington state voters last Election Day found the state opposes a wall by 65 to 34 percent — including 55 percent who said they’re strongly against it. Wait until they learn that we’re now disproportionately on the hook to pay. The promise that Mexico would pay for a wall seemed transparently phony at the time. Yet somehow, incredibly, people bought it. It looks like it may cost us, but at least that big lie finally is being exposed.